Accessibility Three people, two walking one in a wheelchair, on a paved path in a desert setting. 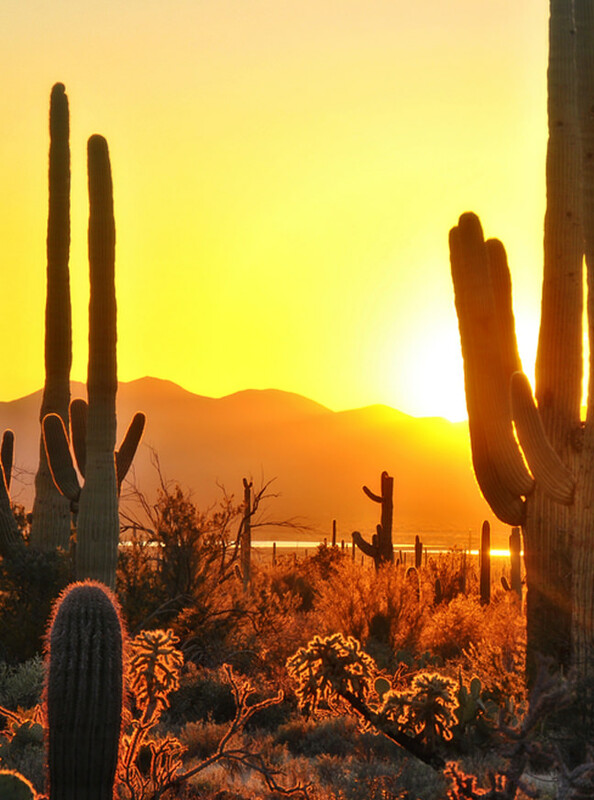 With paved trails at both districts of Saguaro National Park, everyone can enjoy some time off road in the desert. Visitor Centers Saguaro National Park is divided into two districts: Saguaro West in the Tucson Mountains west of the city of Tucson, and Saguaro East in the Rincon Mountains east of Tucson. Both visitor centers have a fully accessible visitor center. Accessible features found at both visitor centers include designated parking spaces, accessible restrooms and drinking fountains, paved cactus garden paths and captioned orientation programs. Saguaro West offers a flowing text device for their orientation program; Saguaro East has descriptive audio devices for its exhibits. Interpretive Programs Interpretive programs are offered throughout the year, with the most programs offered in the busy winter season, November through April. Many of these programs are held in accessible areas in or near the visitor centers, or on paved trails out in the desert. Some programs are auto caravans where interpretive rangers will speak near your car. Indoor and patio programs are another way to access fascinating programs about the Saguaro Cactus and the Sonoran Desert. For more information call either visitor center daily between 9am and 5pm Hours are Mountain Standard Time, year-round, centers closed December 25. Saguaro East Rincon Mountain District 3693 S Old Spanish Trail Tucson, Az 85730 (520)733-5153 Saguaro West Tucson Mountain District 2700 N Kinney Rd Tucson, Az 85743 (520)733-5158 Accessible Trails The Desert Ecology Trail is located at Saguaro East. This 1/4 mile paved trail has exhibits about the plant and animals that comprise the Sonoran Desert community. Resting benches are spaced along the trail. Also at Saguaro East, a 0.7 mile portion of the Mica View Trail is graded to ADA standards and surfaced with a natural material that supports all types of wheelchairs. Park at Mica View Picnic Area or the Broadway Trail head. The Desert Discovery Trail is located at Saguaro West. This is a 1/2 mile paved trail with exhibit signs about the life of the Sonoran Desert. Pavement texturing, and shade ramadas with resting benches are found along the trail. Trail guides in braille and cassette tape format may be obtained at the visitor center. This is an excellent trail for sunset views through a forest of saguaro cactus. * Entrance fees are free with America the Beautiful Pass. Pass may be obtained in person at a federal recreation site or through the mail using the application form. The cost of obtaining an Access Pass through the mail is ten dollars ($10) for processing the application (the Pass is free). Applicants must provide documentation of permanent disability and residency or citizenship.